Hormel Foods Corporation (NYSE: HRL) today reported its performance for the fiscal year 2011 first quarter. All comparisons are to the first quarter of fiscal 2010. All per share results reported here are on a two-for-one stock split adjusted basis. The company reported fiscal 2011 first quarter net earnings of $148.8 million, up 34 percent from earnings of $111.2 million a year earlier. Diluted earnings per share for the quarter were $.55 this year compared to $.41 per share last year. Sales totaled $1.92 billion, which was up 11 percent from fiscal 2010. “We are pleased to report double-digit increases in both sales and earnings for the quarter. All five segments generated year-over-year sales growth. Earnings growth was led by excellent performance by our Jennie-O Turkey Store and Refrigerated Foods segments,” said Jeffrey M. Ettinger, chairman of the board, president and chief executive officer. “Our Jennie-O Turkey Store segment had an outstanding quarter, driven by favorable commodity meat margins and improved efficiencies across the entire supply chain and operations. It also experienced improved sales of value-added products. Our Refrigerated Foods segment had a strong quarter, as well, benefitting from continued high pork operating margins. We were pleased by the performance of our international business in the All Other segment, too. Both our Grocery Products and Specialty Foods segments were pressured by higher commodity input costs during the quarter,” remarked Ettinger. The Grocery Products segment operating profit declined 10 percent, due primarily to higher raw material costs. Sales grew 6 percent, led by higher sales of the SPAM® family of products, Hormel® chili,Hormel® flavored bits and Hormel® Mary Kitchen® hash, and strong sales growth of the MegaMex Foods franchise. The Refrigerated Foods segment had a strong first quarter, with segment operating profit 37 percent greater than last year, as favorable spreads between hog costs and primal values benefitted the segment. Sales grew 13 percent during the quarter, featuring higher sales ofHormel® party trays, Hormel® pepperoni, Hormel® refrigerated entrees, Hormel® Always Tender® flavored meats, and aided by the inclusion of Hormel® Country Crock® side dishes. Jennie-O Turkey Store had an outstanding quarter, with segment operating profit up 122 percent. Better commodity meat prices and improved efficiencies in the supply chain and operations helped drive results. Sales grew 14 percent for this segment with increased commodity meat and value-added sales, featuring increased sales ofJennie-O Turkey Store® turkey burgers, turkey bacon and fresh tray pack items. Segment operating profit for Specialty Foods declined 12 percent, due primarily to higher raw material costs. Sales grew 2 percent, as higher sales of sugar and blended products were partially offset by lower sales of contract manufacturing and sugar substitute products. Segment operating profit for the All Other segment, which consists primarily of Hormel Foods International, increased 29 percent for the quarter, while sales grew 17 percent, led primarily by stronger exports of fresh pork and the SPAM® family of products. Net interest and investment expense was flat with a year ago. General corporate expenses were higher than last year due to expenses associated with the vesting of options under the Universal Stock Option award granted to all employees in 2007. “Due to our strong results in the first quarter, we are raising our full year guidance range from $1.55 to $1.60 per share to $1.62 to $1.68 per share. We expect to see higher input costs the balance of the year, and our team will continue to tackle the challenge of offsetting these added costs with pricing and efficiency gains. Nevertheless, we believe our strong portfolio of branded products and our balanced model should allow us to build upon the momentum of our excellent start,” concluded Ettinger. Effective February 15, 2011, the Company paid its 330th consecutive quarterly dividend, at the annual rate of $.51. The Company’s results will be discussed during its presentation at the CAGNY Conference via webcast at 1:45 p.m. EST on Tuesday, February 22, 2011. Access is available at https://www.hormelfoods.com. The Webcast replay will be available at 3:45 p.m. EST, Tuesday, February 22, 2011, and archived for one year. * Shares and per share figures have been restated to give effect to the two-for-one stock split, which was approved by shareholders at the Company’s Annual Meeting on January 31, 2011. 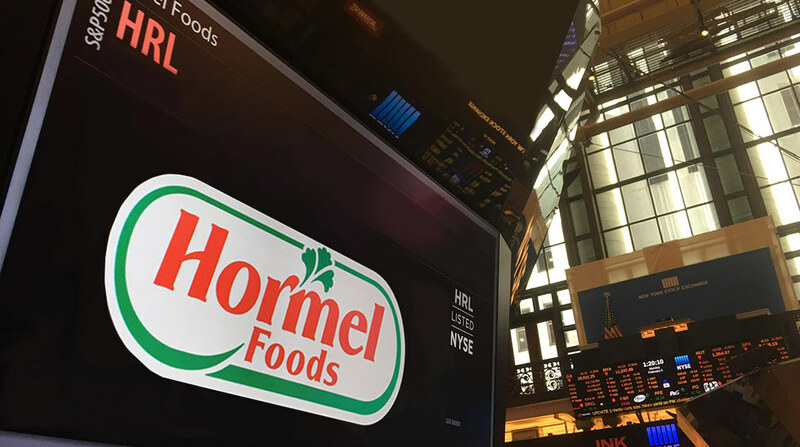 Hormel Foods Announces Two-For-One Stock Split The Hormel Foods Board of Directors has authorized a two-for-one split of the company’s common stock.